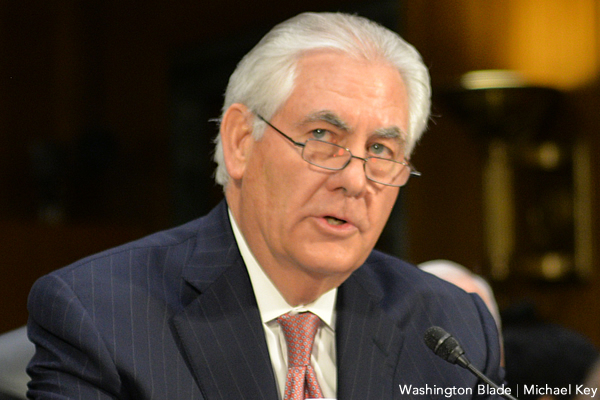 Secretary of State Rex Tillerson admitted in congressional testimony he hasn’t brought up reports of anti-gay abuses in Chechnya with Russian officials, condemning the violence only after repeated questions from Rep. David Cicilline (D-R.I.). But Tillerson conceded he didn’t raise the issue during a meeting with Russian Foreign Minister Sergey Lavrov or any other time. Pressed by Cicilline on whether President Trump brought up the violence with Russian President Vladimir Putin, Tillerson said he’s “unaware” of whether the president discussed the issue. Tillerson’s response is consistent with the comments made last week to the Washington Blade from White House National Security Council spokesperson Michael Anton, who said anti-gay abuses in Chechnya “did not come up in the meetings” with Lavrov. Concerns persist over reports that authorities in Chechnya, a semi-autonomous Republic in Russia, are detaining and torturing gay men at what eyewitnesses have called concentration camps. Despite testimonies affirming those reports, Chechen leader Ramzan Kadyrov has said it’s not happening because no gay people exist in the region. Novaya Gazeta, which first reported the news of the violence, reported last month 26 gay men have been killed as a result of the persecution. U.S. Ambassador to the U.N. Nikki Haley has spoken out against the atrocities, but President Trump has said nothing. Meanwhile, British Prime Minister Theresa May, German Chancellor Angela Merkel and French President Emmanuel Macron have each spoken out against the violence. David Stacy, government affairs director of the Human Rights Campaign, said in a statement Tillerson’s response during the hearing is far from sufficient. Tillerson brings it up while Trump ignores the issue! FAKE POTUS lies and gives no leadership! Well just look at what a vile piece of filth you are. Why would anyone waste their time sticking up for you or your ilk? The pot head calling the kettle stoned! Why? Because not everyone is a putrid waste hole like you. Can you have you have send your obituary to the Blade so we all can enjoy the moment?